The Saint Meinrad Gift Shop in St. Meinrad, Indiana. Saint Meinrad Gift Shop is one of the many works of the monks of Saint Meinrad Archabbey. All proceeds support the work and prayer of the monastery, which includes Abbey Caskets, CareNotes and a graduate-level School of Theology for priesthood students and lay men and women. In addition to inspirational gifts, the gift shop also sells foods & gifts from Monasteries & other special places! This includes items made by the Monks of St. Meinrad Archabbey. Also, when in southern Indiana, be sure visit our actual store located at the south end of campus. You’ll find a large stock of some of the finest in thoughtful and inspirational products on display. Whether you visit us in-person or online, celebrate those special occasions and every-day blessings with a special gift from the Saint Meinrad Archabbey Gift Shop. The Gift Shop is located 1/2 mile south of the intersection of of Indiana State Road 62 and 545. From the east, take Interstate 64 to Exit 72, then travel west on Hwy 62. From the west, take Interstate 64 to Exit 63 and travel south on Hwy 162 to the Intersection of Hwy 62 & Hwy 162. Turn east onto Hwy 62 and follow to St. Meinrad. Saint Meinrad Archabbey is a community of Benedictine monks, founded in 1854, that is committed to prayer and work. The monks serve the Catholic Church and society through their endeavors. Guests are invited to join the monks to pray the Liturgy of the Hours or daily Mass. Please remember that the Archabbey is the monks’ home and respect the private areas of the campus. 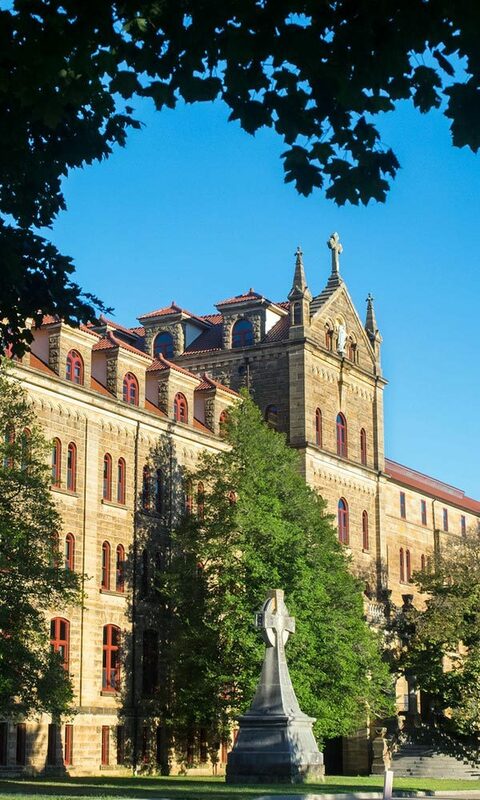 To learn more about Saint Meinrad, guided tours are available Saturdays, from March to November. Brochures on our history and works are also available at the Gift Shop.